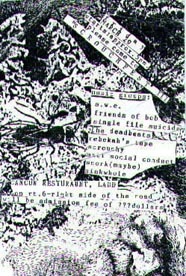 The above 2 flyers are from the first Rebekah’s Tape show. We were still in high school. 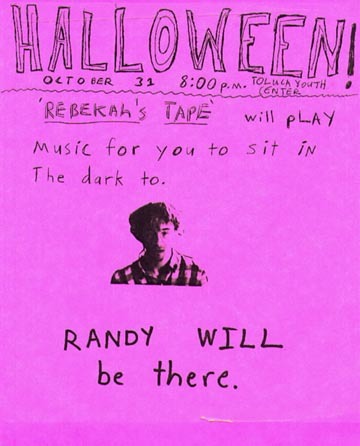 People laughed at Randy being on the flyers, AS WE INTENDED THEM TO DO. The Toluca Youth Center is one big room having only a tiled ceiling to absorb the sound. Every other surface in the room just reflects it. At this time we were borrowing a huge 300 watt guitar amplifier from our friend Tyler. We blew a speaker in it either before or after this event –we don’t remember. It made things very very VERY loud, when without the amplifier (at previous Lotkap shows) everything was just “very” loud. Dustin/Mike/Randy played a bunch of silly covers, then basically all of the songs from “is Happy Happy Haps” were played by Shawn/Mike/Dustin. 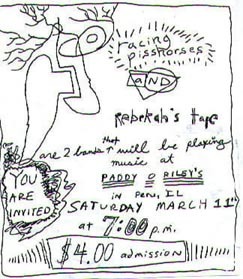 “Cowspit” and “Falling Down The Stairs” from ‘Rebekah’s Tape’ were played also. The last song of the night was “Falling Down The Stairs”. 90% of this song has Shawn making preposterous feedback and noise. Whenever the speaker in Tyler’s amp was blown, it was blown while playing this song. Dustin lost hearing in one ear for approximately two weeks resulting from rehearsing this song one night in the basement. The jerk stood too close to the amp. Having it pointed at his face didn’t help either. For this song on this night Shawn brought another guitar/effects setup to add more sound. He spent a lot of the song stomping on a crappy heavily amplified and distorted guitar (one we named “porcules”-a combination of porcupine and hercules). Inevitably, yet mysteriously, there was much less than the original 25 people in the building at the end of the 20 minute song than at the beginning of it. Summary of show: loud. slappy. low-key. halloween. This is the first time we played IN La Salle. 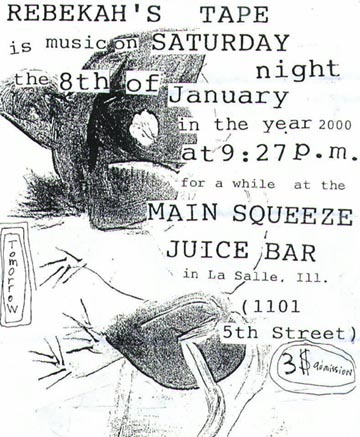 The Juice Bar was in its veritable heyday at this time. It’s crazy how many people showed up. The show started at 10:30 pm and we played for probably two and a half hours. At this time Dustin was not ‘officially’ a part of the group. Mike had a huge stomach ache. Cory was our friend at the time & he joined us very late in the set to play saxophone on “Tequila” (the pee-wee herman dance song). It was perhaps the liveliest few minutes of the night. 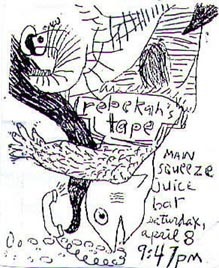 At a Cancun show this last spring (2003) Mike ran into a guy who said the last time he saw rebekah’s tape was at this, their first, juice bar show. Mike apologized and meant it. 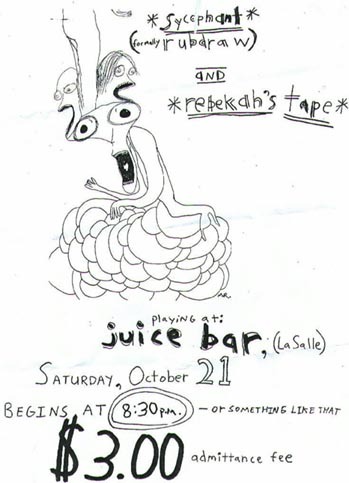 We think that this was the second time rebekah’s tape played at the juice bar. There was insufficient vocal amplification power, so for the first hour or so of the show we played a bunch of covers while Cory took Mike’s car to Tonica and retrieve his bass amp to make the voice more audible. Cory was not yet in the group. Dustin, still not an ‘official’ member of the group, just happened to be there at the show so he played bass for some of the old covers…it helped a lot in taking up the time Cory took to get his amp. It was sentimental to play with Dustin again. When Cory got back we rigged his amp into the voice amplification setup (we used to link about 6 amps together through a mixer and turn them up as loud as they would go without feeding back. On this night one of our main amps was not working.) and played the set of our own songs that we had originally intended to play. It was quite fun. People were happy. 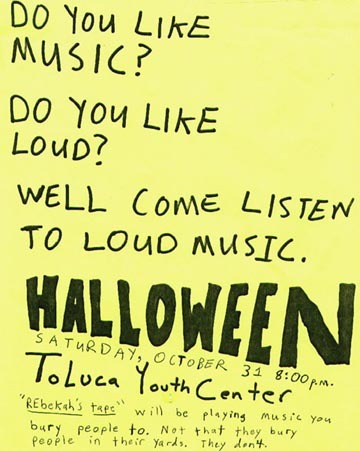 Mike made several handmade flyers along with the handout b/w copied flyers, rather than just making larger versions of the hand-sized ones. 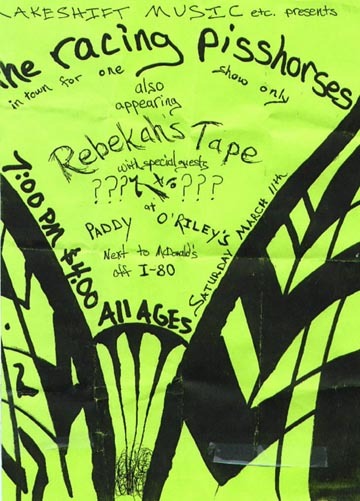 We 'released' "rebekah's tape is manatees" at this show. 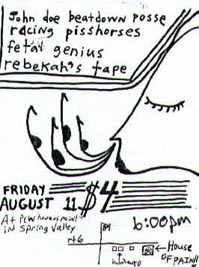 one of the sycophant (fetal genius/forMERly rubdraw)/rebekah's tape brother band shows. we used to share equipment. On this night our friend Dave handed out “HELLO my name is…” name tags. (“Phlegm” is an example) It was a pleasant additive to the enjoyment of the night. 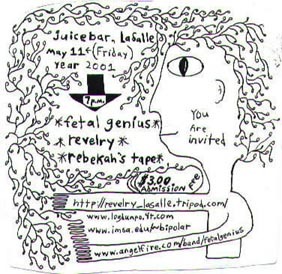 It was the usual rebekah’s tape/sycophant (fetal genius/rubdraw) juice bar show: wacky dancing, sweat,…phlegm. Rocko gave our 15 year old friend Trish an unannounced and uninvited shoulder rubbing this night. This was at the time that we still had Uncle Brian selling our stuff for us. We didn’t sell much back then. We later came to the conclusion that those two facts may have been interrelated. we don't remember anything about this show. do you? first show at the PCW. hot. damn hot. the room didn't breathe, I'll tell you that. 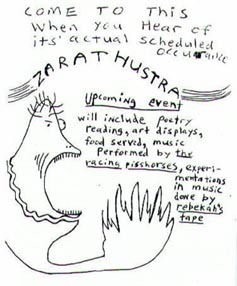 This fellow had shows in his basement/garage once a year. 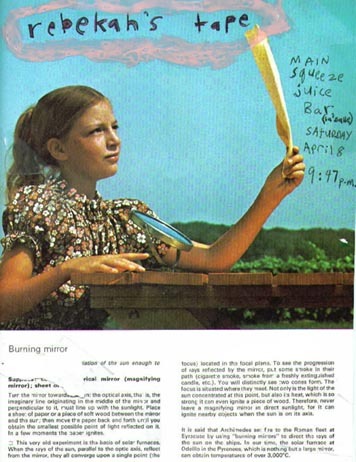 This was the first year it was a non-in-home show. It was held at the Cancun in Ladd. If you are named “Bob”, you can have “Bobfest”. This fellow is nicknamed “Scrouch”, so he had “Scrouchfest”. Each member of our group was given an “ALL ACCESS PASS”. For the first song we played this night (‘flags at half mast’)we had Sean, Zack, and Matt from the John Doe Beatdown Posse, Tim (and Jared?...and Chris??) from SWE, Nate from Fetal Genius, and probably 2 or 3 other people playing extra percussions & instruments with us. Sean, Zack, and Matt had to pay $5 to play with us. They were not granted all access. The Cancun was transformed for one night into a SERIOUS ROCK ARENA. The soundman had a headset. It was for real. 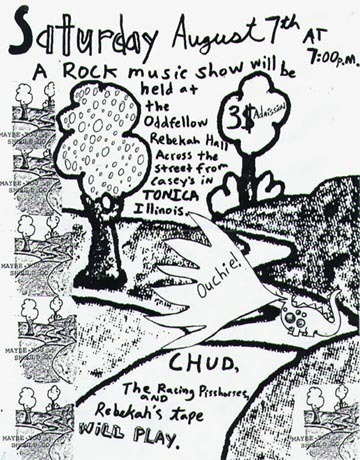 There were big bands there…..from BLOOMINGTON and PEORIA, people. 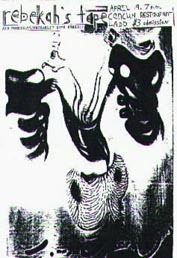 “Sinkwhole” and “Single File Suicide”. Autographs were given, managers were schmoozed with, awe was inspired, toilets were flushed. We had fun playing though, honestly. We hadn't played for a few months. This was probably the largest crowd to ever observe us. It was an interesting thing to happen. this is exactly one year before the radiation flowers release party. we don't know what the heck happened though. do you? we can't really say too much about this here item. mind-bob=blank. 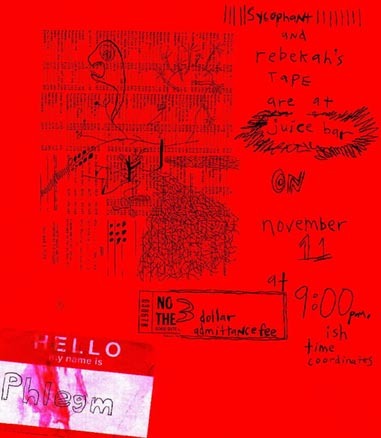 : “Rebekah’s Tape is Radiation Flowers/Professionalism” “RELEASE PARTY!!!!!!!!! 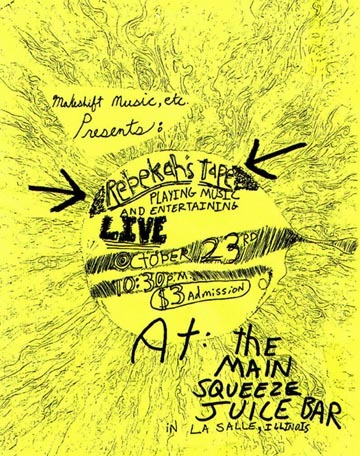 !” This is also when MAKESHIFT Music,etc./Eeffoc & Maps officially changed to Intangible Cat. A lot of our friends brought silly lights and decorations, and a lot of people wore costumes. 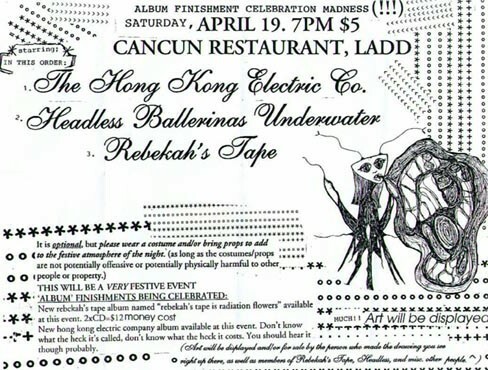 The Hong Kong Electric Company released their “Hong Kong Electric Co. is Rebekah’s Tape” cd, and for their performance had a little village made of cardboard. Somehow Sean ended up groggy and disoriented on the hood of Mike’s car at the end of their set. The police came and talked to him thinking he was perhaps a bad person for lying on someone else’s car. There was drama. Heat was on. Headless Ballerinas Underwater played, wearing bloodstained (probably not real blood, but maybe) butcher’s aprons. 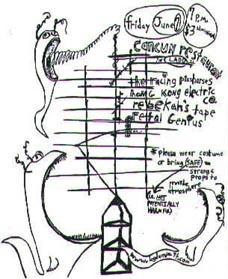 Dan Kelly read his surreal brain sketches over a wall of concentrated unnerving quasi-musical odd. R tape played a video on the large projection screen next to the stage. After the video they made ended, a video of Ren & Stimpy was played. People found their video humorous and strange, and found Ren & Stimpy to be as Ren & Stimpy are: better than bad. (good) (LOG!) Headless also showed video on the large screen. Theirs was much more creepy though. Lots of people came and had happy weirdo fun. If you have any pictures from these shows or other flyers we don't have, please email us and we'll put them up. cowchimes@hotmail.com Thanks.